When it comes to receiving a good night’s sleep, the mattress you choose makes all the difference, especially if you are overweight. You not only need to consider your preferred sleeping position as you select the best mattress for a heavy person in the UK but also your body type. Heavier individuals will have different needs for support and pressure relief than a light-weight person or a small child. These beds also need to be more durable to handle more weight better and provide excellent temperature cooling features. As you look for the best mattress for heavy people in the UK, there are several products you should consider. Here is some guidance to help you make a perfect choice and receive a restful night, every night. If you want ultimate comfort throughout your night, the Ghostbed should be at the top of your list. This memory foam mattress features three layers that combine to create a durable, thick, and comfortable bed. This memory foam product is 27-centimetres deep, which is much thicker than similar products. It offers 19.5-centimetres of high-density support, which not only helps keep your body aligned, but the thick design increases the lifespan of the product, helping you enjoy for years to come. The second layer features 4.5 centimetres of gel memory foam, to help reduce the absorption of heat. Its 3-centimetre top layer provides additional comfort and promotes airflow, helping you keep cool all night long. The combination of these two foam layers dispels heat during the night and prevents waking you up and disrupting your sleep. However, several users of the Ghostbed say it still sleeps on the warm side and does not provide the cooling quality that they desire. This bed can support sleepers up to 340 kgs, which provides adequate support for most heavy people and their partners. Additionally, it boasts a firmness rating of 6.5, which is the ideal firmness for all sleeping positions, but those who personally prefer a softer mattress may find it is a little firmer than they prefer. 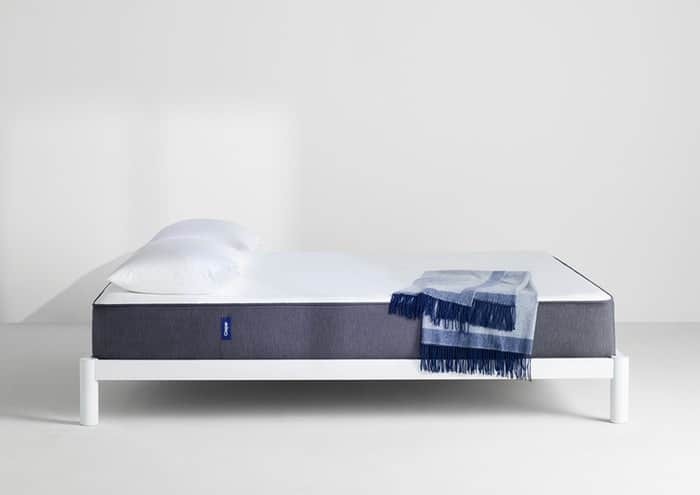 When you sleep on the Casper each night, you don’t have to worry about you or your partner’s body size as this product features an unlimited weight limit — a rare quality in a mattress. This memory foam mattress has four layers of premium foam that create a comfortable, cool, and relaxing night’s sleep. It is designed to help relieve pressure on your joints so you wake up feeling refreshed and rejuvenated rather than stiff and sore. The foam used on this bed is an open-cell foam which helps improve the breathability and airflow of the product and pushes the hot air away to keep you cool throughout the night. However, be aware that the Casper does have a strong smell that may remain for a few days after you unbox it. This is known as off-gassing, and is common with mattresses made of foam. If you enjoy multiple sleeping positions, this foam mattress is ideal. It has a firmness level of 7, meaning it provides adequate support for back and side sleepers. It still offers some cushion for stomach sleepers who need a softer bed, but it may be too firm depending on your personal preference. Keep in mind that if you sleep with a partner at night, you may feel them toss and turn. This mattress for obese people in the UK has good motion isolation properties, which can stop you from disturbances during the nighttime hours. If you love a firm bed, the TEMPUR Contour Lexe will deliver. It is 30-centimetres thick, which increases the durability and support of this mattress. This TEMPUR product features a strong support base, which helps your entire body feel supported no matter your position or weight. Additionally, this bed provides a top comfort layer, which helps reduce the pressure on your joints and eliminates those dreaded sleeping pains. One advantage to the TEMPUR Contour Lexe, particularly when compared to other beds for heavy person in the UK, is it requires very little maintenance. The cover on can be removed and washed in a machine, and due to the design, you don’t have to remember to regularly flip it over like other products. You will have 100 days to test out this item, which is standard for many beds on the market today. If you do not like it, it includes a 100-night money-back guarantee, which means you have nothing to lose if you do not receive the comfort and support you desire from it. The Dormeo Memory Plus is a memory foam mattress that is medium firm, which is perfect for all sleeping types. It is only 17-centimetres deep, making it a much thinner mattress than other products built for obese and heavier individuals. This bed can support people up to 22 stone, which is ideal for heavy individuals. But, for severely obese people, or if both you and your partner are both very overweight, you may not find the full support you need from this product. The Domeo Memory Plus features two foam layers which provide ample support and cushion throughout the night. It also protects against dust mites, allergens, and other pollutants that can affect your health. And to help you stay cool all night long, this product boasts four built-in air vents that help circulate air around your body, helping you keep cool and dissipating that hot, sweaty air from disrupting your sleep. The Dormeo Memory Plus can last for a minimum of five years before you will need a replacement, but it is known to develop permanent indentations and lose its support within the first few years of purchase. This would, however, be a direct factor depending on your weight. 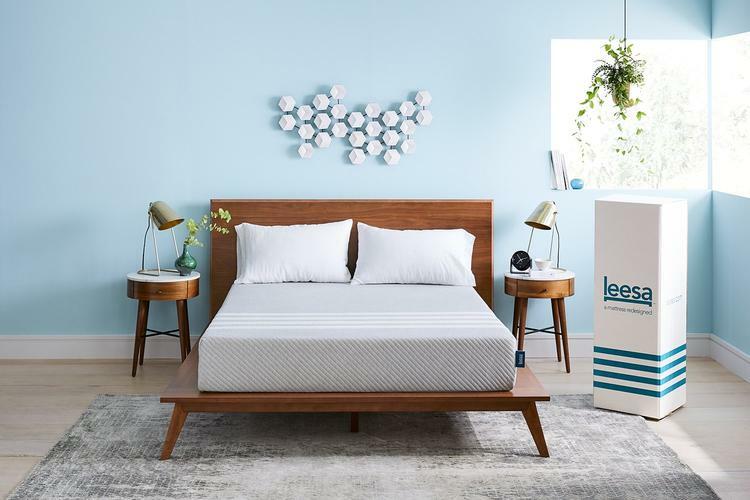 The Leesa is a memory foam mattress that offers plenty of bounce and keeps you adequately positioned throughout the night. It Is a memory foam product with three layers that combine to provide strength, support, and sufficient durability. For most sleepers, the Leesa is ideal. It allows you to change positions with few issues and you have support regardless if you are on your back, side, or stomach. Additionally, it does an excellent job of relieving your pressure points, helping your entire body feel supported and ensures you wake up feeling refreshed and ready to tackle the day. A comfort layer on this product allows for some airflow through tiny holes located on the top, and it features a breathable cover, which helps you stay cool and prevents hot, sweaty air from sticking around. However, some overweight users of this product say despite these designs, the mattress still sleeps hot. The Leesa can support sleepers up to 21 stones. For heavier individuals, Leesa won’t provide the full support their body needs, but for those who are slightly overweight or just a little larger in size, this bed will provide the support needed to keep their body well positioned and to help them wake up feeling refreshed and ready to tackle the day. The support the mattress provides should be one of the most important factors you consider as you choose the right bed for your needs. As a larger individual, you need a mattress that keeps your body on top and your spine properly aligned despite any additional weight. This means you want to avoid any significant sinking in and should purchase a product that contours to your body’s natural curves. Additionally, consider thick products. As you put more weight on the bed, over time, it will sag, and your support will decrease. Thicker beds provide ample support, and significant sagging is less likely to take place. Rather than wake up feeling stiff and sore each morning, consider a mattress that provides ample pressure point relief. As a heavier individual, you also want the proper relief and support for when you lay in the bed but change positions during the night as well. The best beds for heavy people in the UK should be on the firmer side of the spectrum. This helps keep your body adequately supported and prevents too much sinking in. However, your preferred sleeping position will affect the level of firmness you should choose. For side sleepers: Sleepers who prefer this position need a soft to medium-firm product. You want a bed that forms to the curves of your body and provides excellent pressure relief. If the mattress is too firm, you will experience pain in many areas of your body such as your back and neck. For back sleepers: A firmer product is ideal for back sleepers. Individuals who prefer this sleeping position need a bed that keeps their spine aligned, rather than sinking into it, which places additional pressure on various joints on the body. For stomach sleepers: Stomach sleepers should look for a product that is medium-firm. This means it is firm enough that they sleep on top of the bed but also provides some bounce, so their major joints are supported. Improper support will cause the spine to curve and eventually lead to back pain. When you become hot and sweaty during the night, it disrupts your sleep cycle, causing you to wake up feeling tired each morning. Temperature regulating characteristics should be a “must-have” feature and keep you feeling cool and comfortable as heavier individuals will sleep hotter than average-sized or lighter-weight individuals. Many memory foam products feature cooling gel and foam layers that increase the airflow around your body. These layers help push the hot and moist air away. Each product can boast a different type of cooling feature and some work better than others. It is recommended to read many customer reviews to determine if a bed indeed sleeps cool or if it is merely a marketing ploy. If you truly seek a cool bed, consider a spring and coil product. Latex and hybrid options are also known to sleep relatively cool, while memory foam is the material that sleeps the hottest. As you look for the best mattress for obese in the UK, the Ghostbed stands out from the competition. This is one of the best products for above-weight individuals due to its supportive and comfortable design. Its three layers work to keep your body on top of the bed and naturally contours to the curves of your body. Additionally, this product boasts a 6.5 firmness level, which is ideal for most sleeping positions but is on the firmer side of the spectrum — ideal for heavier individuals. Many similar products are also on the firmer side but may be too firm for personal preference. Also, this bed provides proper supports for individuals up to 340 kgs, which is more support than other products on our lineup. 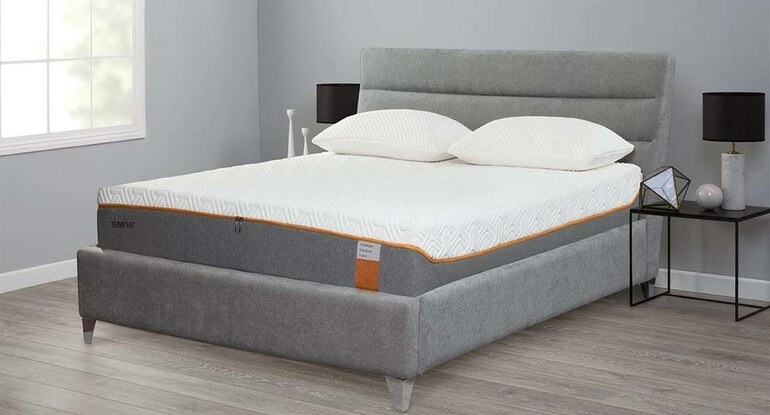 The Ghostbed is one of the most comfortable, durable, and supportive mattresses available for heavier individuals in the UK and stands out when compared to other similar products available on the market today.